Recently I was attending a workshop and I was asked to complete an activity that I often ask others to do. The task was to complete a double-sided worksheet that consisted of lines of unfinished sentences, commencing with the phrase “I am…”. 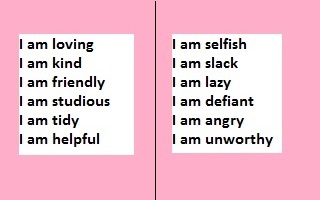 Many people will be very familiar with this sort of exercise that is used often for the purpose of developing self-esteem. This time the exercise held a different objective. The instructions for the activity were: “On the front of the page, complete the sentences with positive descriptions about yourself, and on the reverse side, complete the sentences with negative descriptions.” At the end of the exercise, everyone finished up with one complete page of positive sentences about themselves, and one complete page of negative sentences. We were then asked: “Which side is correct, the positive side or the negative side of the paper? Who are you really? What do you think the answer was and what was the point of this exercise? The point of the exercise was to demonstrate the concept (and the answer to the question) that we are neither side of the sheet. We are neither the positive side, nor the negative side, nor both sides put together! Each of our responses are simply our own thoughts, opinions and judgments about ourselves that may or may not be validated by any other person, or even by ourselves at any other point in time. Some of our descriptions may be true some of the time, but none of them are eternal truths about ourselves. So who am I really? What is the truth? How do I arrive at a true appraisal of myself and develop my self-esteem? The truth is that we are more than any of our feelings or evaluations. If we let go of our thoughts, feelings, opinions and judgments, we are left with our true reality: our Being. Our inherent value is in our Being-ness, and this is much more profound (and stable) than our thoughts or our feelings. 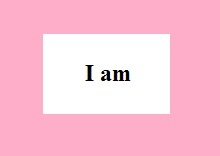 My fundamental truth lies wholly within the statement: “I am.” It is my timeless and unchanging reality. Thanks for reading and offering comment Meghan. Thanks for your comments Belinda. I think it’s easy for ‘me” to get smothered with all the roles that we play. Thanks for your comments Amalia. We are so well trained in how we are doing and how we are viewed that we can completely forget about our essential Being.